We are just days away from the end of November and that means only one thing, that the Christmas countdown is just around the corner. It’s not long until you will have the festive tunes on repeat, the tinsel out and a perfectly valid excuse to delve into some supersize tubs of chocolate and gulp on buckets of mulled wine…Go on you know you want to! This post is all about counting down to Christmas with not a single santa shaped choccy in sight! During The past month I have been checking out some advent calendars with a difference and I just had to share these treasures with you. This is an insight into a world of beauty behind closed doors, simply an enviable list of advent calendars. These are filled with beauty, jewellery or trinket surprises and I think these are such a fab and exciting way to countdown to that magical day. Which one will you choose? With this calendar you have 24 ‘sweet shoppe’ doors to open. 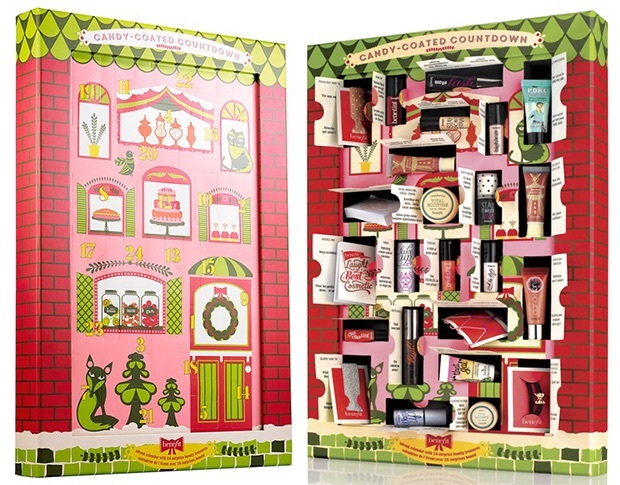 It contains 18 miniature beauty best sellers from Benefit and 6 useful accessories/gifts. I love mini products, they are a perfect size for your handbag or night away when suitcase space is limited. 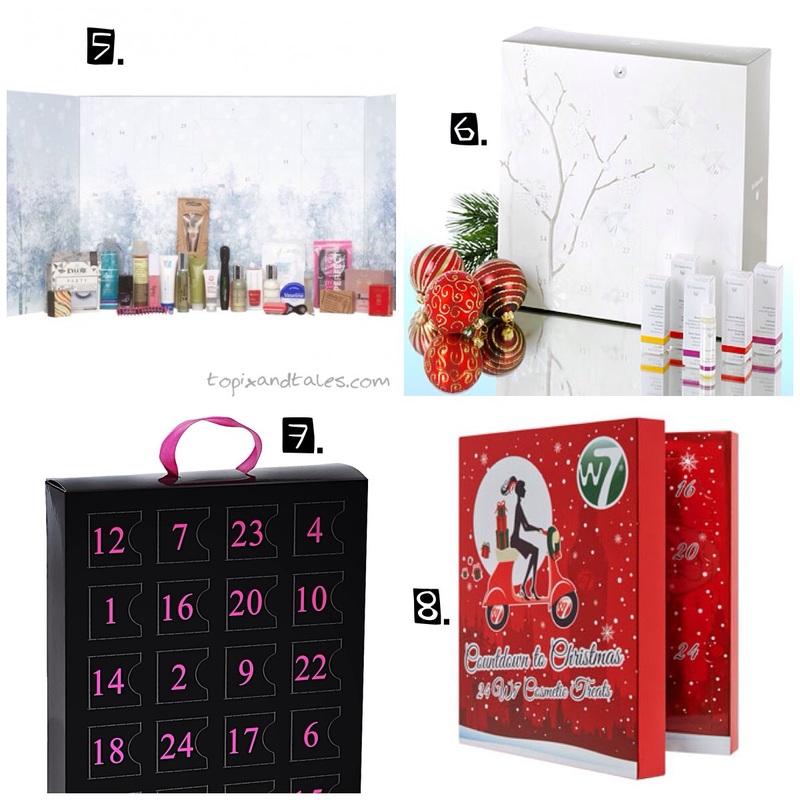 We all have different beauty needs and there is no way we are all going to love every product on the shop shelves, so this advent calendar will introduce you to new products and give you a chance to find out whIch ones are most suited to your make-up bag. This is limited edition, with only 8,000 being sold in Debenhams and Benefit Boutique Stores, so you will need to shop fast to get your hands on this candy coated countdown! be sure to have quite a collection by Christmas Day. Behind each door, in addition to a best seller product you will also find a daily beauty quote to read, I think this is a great extra feature. There is no doubt that this calendar you will leave you feeling pampered and preened and smelling divine! With the contents worth £130.00 you are sure to be grabbing your self a real bargain with this beauty box. This is literally nail heaven! This London based brand is offering 24 different nail polishes; long lasting shades carefully selected and all packaged in what reminds me of a classic dolls house. With this fantastic calendar, there’s no excuse for dull nails during this festive season. There is bound to be a favourite for everyone and a match for each of those Christmas party outfits. A nail queens dream! This Calendar is definitely one of those ‘love, want, must-have’ pre Christmas goodies. It is packed with luxury, featuring some of the best beauty brands of today including Lancôme, Yves Saint Laurent, Khiel’s and many more. Behind 24 doors, lies a selections of make-up, skin care and fragrance miniatures suitable for all you ladies that love beauty. This night end hall of beauty has a draw for each day and has been designed to replica the iconic London department store. Behind the draws of this Tudor style treat, are top brands of beauty, making this a whole house of luxury. This includes premium products from industry greats such as Nars, Diptyque and Laura Mercier. 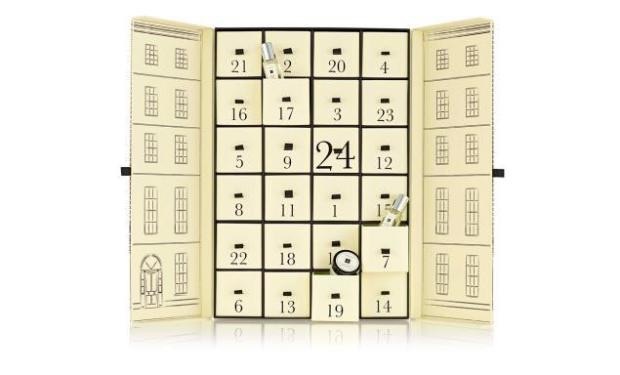 This is literally a little box of luxury and in terms of advent calendars this is probably what dreams are made of! Unfortunately, the down side of this is that it comes with a hefty price tag. Retailing at £250, for many of us, myself included, this limited edition treasure will probably never make it off my wish list! Each morning opening a draw of this calendar you will discover an indulgent daily dose of beauty in the form of bath and body creams, or refined fragrances. 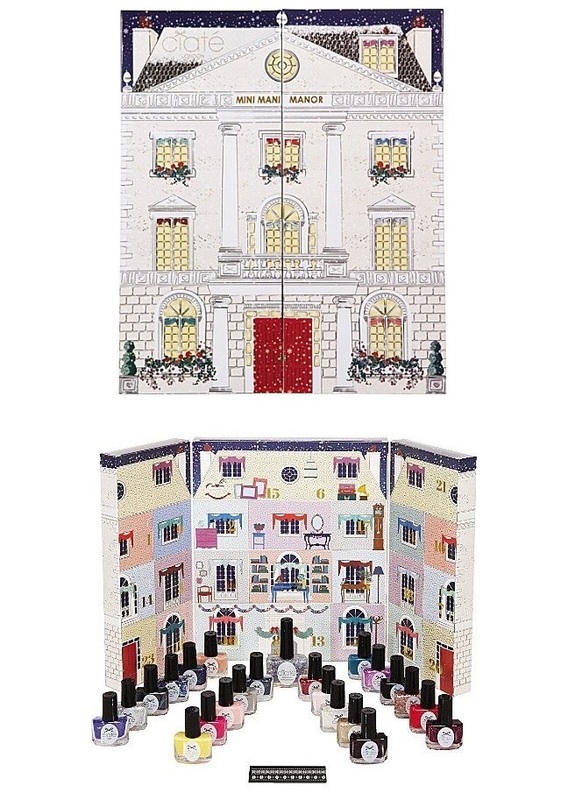 This cream and black calendar has been designed to replica a Georgian townhouse and both the illustration and gifts seem elegant, and a practically perfect way to countdown to Christmas. This includes a collection of goodies that is bound to get you through those dark and cold winter mornings. It includes must have brands from the likes of Essie, Burts Bees, Molton Brown, Rituals and Liz Earle – just to name a few. I find that miniature sized samples are a brilliant way of trying new products before committing to spending those savings on a full size version. The products in this Calendar are worth more than £200, so you will be saving some pennies as well as making a generous addition to your beauty collection this Christmas. With this range of lust-have Calendars, it’s easy to say Christmas is looking more beautiful already. Seasonal sought after beauty products, a selection of decadent miniatures, are for sure a girly and glamorous way to brighten up your December mornings. Have you already bought one of these gorgeous pre-Christmas gifts for yourself of a special someone? If not browse and buy soon, as they are flying off the shelves. Don’t forget to let me know in the comments which one you choose and keep me updated with what’s behind those doors over the next month. Thanks for the info, these calendars are a great idea if you’re trying to be healthy in the run up to Christmas. I blog often and I genuinely thanbk you for your content.